Scapular dyskinesis is an alteration in the normal position or motion of the scapula during coupled scapulohumeral movements. It occurs in a large number of injuries involving the shoulder joint and often is caused by injuries that result in the inhibition or disorganization of activation patterns in scapular stabilizing muscles. It may increase the functional deficit associated with shoulder injury by altering the normal scapular role during coupled scapulohumeral motions. The scapula serves many roles in order for proper shoulder function to occur. These roles include providing synchronous scapular rotation during humeral motion, serving as a stable base for rotator cuff activation, and functioning as a link in the kinetic chain. Each role is vital to proper arm function and can only occur when the anatomy around the shoulder is uncompromised. The presence of bony and soft tissue injury as well as muscle weakness and inflexibility can alter the roles of the scapula and alter scapular resting position and/or dynamic motion. This altered scapular position/movement has been termed scapular dyskinesis. Although it occurs in a large number of shoulder injuries, it appears that scapular dyskinesis is a nonspecific response to a painful condition in the shoulder rather than a specific response to certain glenohumeral pathology. The presence or absence of scapular dyskinesis needs to be determined during the clinical examination. Scapular dyskinesis appears to be a nonspecific response to shoulder dysfunction because no specific pattern of dyskinesis is associated with a specific shoulder diagnosis. It should be suspected in patients with shoulder injury and can be identified and classified by specific physical examination. Treatment of scapular dyskinesis is directed at managing underlying causes and restoring normal scapular muscle activation patterns by kinetic chain–based rehabilitation protocols. Three-dimensional biomechanical analysis of possible scapular movement shows that the scapula moves around three axes of motion simultaneously. Patterns of abnormal motion in scapular dyskinesis are best observed by first determining the position of the scapula with the patient’s arms at rest at the side, then by observing the scapular motion as the arms are elevated and lowered in the scapular plane. These dyskinetic patterns fall into three categories, which correspond to the three planes of motion on the ellipsoid thorax. This system can help identify the type of abnormal scapular motion and thus the rehabilitation required by muscle strengthening and restoration of flexibility. Type I is characterized by prominence of the inferior medial scapular border. This motion is primarily abnormal rotation around a transverse axis. Type II is characterized by prominence of the entire medial scapular border and represents abnormal rotation around a vertical axis. Type III is characterized by superior translation of the entire scapula and prominence of the superior medial scapular border. The net effect of the scapular dyskinetic patterns is an adverse effect on the normal role of the scapula in shoulder function. Lack of full scapular retraction causes loss of the stable cocking point in throwing or loss of the stable base in arm elevation. Lack of full scapular protraction around the pectoral girdle increases the deceleration forces in the shoulder joint and causes changes in the normal safe zone relationship between the glenoid and humerus as the arm moves through the acceleration phase. Too much protraction because of tightness in either the joint capsule or the anterior coracoid muscles will cause impingement as the scapula rotates down and forward. Loss of protraction control also creates functional anteversion the glenoid, decreasing the normal bony buttress to anterior translation. This may increase the shear stresses on the rest of the anterior stabilizing structures- the labrum and glenohumeral ligaments- thus increasing the risk of shear injury or strain. Posteriorly, this anteversion increases the degree of impingement between the posterior superior glenoid and posterior rotator cuff by moving the posterior aspect of the glenoid closer to the externally rotated and horizontally abducted arm. Loss of ability to elevate the acromion can be a secondary source of impingement in other shoulder problems, such as glenohumeral instability. The serratus anterior and especially the lower trapezius appear to be the first muscles involved in inhibition-based muscle dysfunction. Lack of acromial elevation and consequent secondary impingement can be seen early in many shoulder problems, such as rotator cuff tendinitis and glenohumeral instability. This can play a role in the development of further symptoms. One of the most important abnormalities in scapular biomechanics is the loss of the link function in the kinetic chain. If scapular motion is impaired, the forces generated from the lower extremity and trunk will not be effectively transmitted to the upper extremity. Scapular evaluation should include distant contributions to normal scapular function and dyskinesis. Similarly, dynamic evaluation of motion, muscular activation, and corrective manoeuvres should be done. Most of the abnormalities in scapular motion or position can be treated by physical therapy to relieve the symptoms associated with inflexibility or trigger points and to re-establish muscle strength and activation patterns. Surgical treatment is used to repair the source of the underlying abnormalities and often is an integral part of the treatment program. Bony abnormalities such as malunion of a clavicular fracture or an acromioclavicular joint separation may be the cause of the dyskinesis. More commonly, the source of muscle inhibition or imbalance is glenohumeral internal derangement, such as instability, labral tears, rotator cuff injury, or tendinitis. When structural problems or the internal derangement has been corrected, scapular muscle rehabilitation may be initiated. Rehabilitation of scapular dyskinesis is based on a proximal- to-distal protocol. It emphasizes achieving full and appropriate scapular motion and coordinating that motion with complementary trunk and hip movements. Once scapular motion is normalized, these movement patterns serve as the framework for exercises to strengthen the scapular musculature. Function, rather than time, determines a patient’s progress through this protocol. In the early rehabilitation phases, hip and trunk motions are the foundation necessary to achieve appropriate scapular motion. As scapular control increases, scapular exercises may progress by decreasing the emphasis on proximal facilitation. This protocol may be seen as a flow of exercises that progress as the patient achieves more proximal control and advances toward integration of the scapular exercises with shoulder and arm exercises. Outcome studies using this rehabilitation protocol have not been reported but are in progress. Our clinical experience has shown that achievement of scapular control decreases rotator cuff soreness and improves rotator cuff function, especially early in rehabilitation. (1) Initially, avoid painful arm movements and positions and establish scapular motion by proximal facilitation. (2) Begin soft-tissue mobilization and assisted stretching if muscular inflexibility is limiting motion. Of particular importance are the pectoralis minor, levator scapulae, upper trapezius, latissimus dorsi, infraspinatus, and teres minor muscles. Active, active-assisted, passive, and proprioceptive neuromuscular facilitation stretching techniques are effective in restoring muscle flexibility as well as the range of motion of glenohumeral joints. (3) Begin upper extremity weight shifting, wobble board exercises, scapular clock exercises, rhythmic ball stabilization, and weight-bearing isometric extension to promote safe co contractions. Use these closed kinetic chain exercises (CKC), in which the hand is supported or has weight applied to it, in various planes and levels of elevation if the scapular positioning is appropriate. These may be started at low levels of abduction and external rotation, then may progress to 90° abduction as tolerated. (4) Initiate scapular motion exercises without arm elevation. Use trunk flexion and trunk medial rotation to facilitate scapular protraction. Use active trunk extension, lateral trunk rotation, and hip extension to facilitate scapular retraction. (5) Include arm motion with scapular motion exercises as the scapular motion improves. Initially, keep the arm close to the body to minimize the intrinsic load. An excellent early scapular stabilization exercise is the “low row,” which includes trunk/hip extension, scapular retraction, and arm extension. Proximal stability and muscular activation are imperative for appropriate scapular motion and strengthening. Strengthening is dependent on motion, and motion is dependent on posture. (1) Initiate greater loads with CKC exercises such as wall push ups, table push-ups, and modified prone push-ups. Also, increase the level of elevation of CKC exercises as scapular control improves. Position the patient for CKC exercises by placing the hand, then moving the body relative to the fixed hand to define the plane and degree of elevation. (2) Add arm elevation and rotation patterns to scapular motion exercises, as tolerated. If intrinsic loads are too great with the introduction of active elevation, use axially loaded active range-of-motion exercises as a transition to open kinetic chain exercises, in which the hand is freely movable. Wall slides are an example of transition exercises. (3) Begin kinetic chain tubing exercises using hip and trunk extension with scapular retraction, and hip and trunk flexion with scapular protraction. 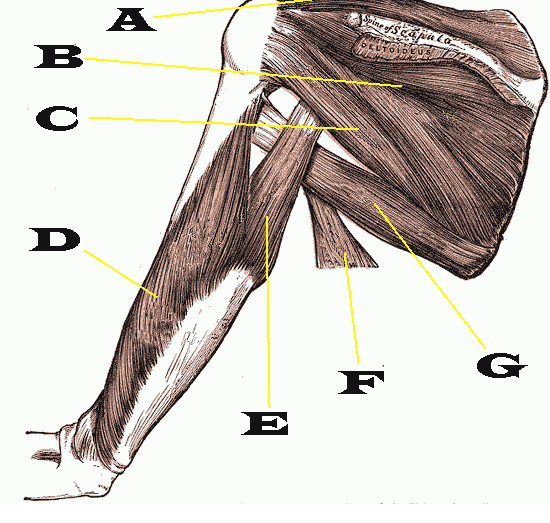 Varying angles of pull and planes of motion are used to reproduce appropriate scapular functions. (4) Use lunges with dumbbell reaches to emphasize kinetic chain timing and coordination. Vary the level of arm elevation, amount of external rotation, and degree of elbow flexion in the standing or return position to increase the functional demand on the scapular muscles. Avoid scapular compensations such as winging or shrugging. (1) When there is good scapular control and motion throughout the range of shoulder elevation, initiate plyometric (dynamic stretch-shortening) exercises, such as medicine ball toss and catch and tubing plyometrics. (2) Overhead dumbbell presses and dumbbell punches, in various planes are advanced exercises requiring good scapular control through a full and loaded glenohumeral range of motion.